What if the phone rang tomorrow and ….? Where the **** do you start with an Olympic sized lighting design? Or any large scale lighting design for that matter? Well, you’re not Durham Marenghi – yet. 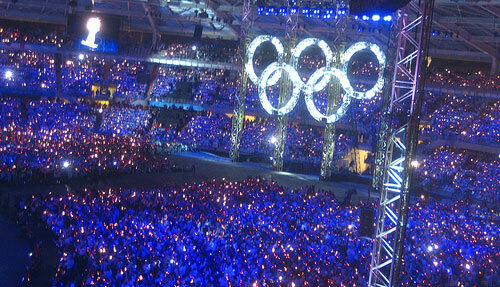 Super scale lighting design, like an Olympic ceremony, is the domain of a handful of international lighting designers. However, specifying large rigs for complex shows is part of the daily grind of a working LD. This article looks at how the LD breaks down a seemingly complex design into manageable chunks and how changes in technology have opened up more possibilities. It seems like you need a mountain of kit to light the Olympic Opening Ceremony. Hundreds of moving lights, all with their own mains supply, control signals and rigging. Thousands of individual components that need to be mustered into an equipment inventory. Trouble is, the organisers want to budget. The equipment suppliers want to know how much kit they need to source and production are anxious to get the crew numbers to book hotels for. And they need to know by the end of the week. You don’t know much about the show yet, either. Lighting a school play, maybe you have six areas of general cover on stage. Each area needs 2 500w fresnels of front light, 1 backlight. That’s 18 fresnels to start. The stage is wide enough to need 6 3-cell Cyc lights, and you want 2 fresnels per side for sidelight. The director wants 4 profiles spots for specials and you want a gobo wash using 4 more. So, you have an equipment inventory based on a series bite sized pieces – 6 stage areas, cyc, stage specials etc. etc. (Of course, the truth is that most small lighting designs are based on “what you have” rather than “what you need”). You get the idea. A large scale lighting design is approached in the same way. “ I need N many of these HuugeBeemz ™ to cover an area of X at the brightness of Y. There are Z many areas in the arena, and each one also needs 2 WobbleBlasdz ™ ……” and so on. Before you know it, your kit list has 2700 moving lights. You turn your attention to power, rigging and other infrastructure. In the end, detailed cable inventories will all be created using the same approach. Scalable elements and symmetry. Every show has things you need from the lighting – I call them “jobs”, and they eat up your resources. Keylight, colour washes, cyc lighting and other “unexciting” things make up a large percentage of you equipment inventory. These mundane parts of a lighting design often take less “thinking about” as your decisions are based on practicalities – available positions, audience layout etc. It is usually the first stage of the design process and often your kit list is already straining under the weight of fixtures and power requirements. The next stage of equipment allocation centres around other required elements. “ We need to highlight this area. This piece of set needs to change colour” etc. So far, we have a list of “jobs” and lighting equipment to do those jobs. The spreadsheet is several pages long and it seems as if all of the “Lighting Designer decisions” have been made for us. Don’t worry. With a small percentage of our resources left – it’s time to get creative. The final parts of our grand lighting design to consider are things we, or the director/producer/government official, would really like. Media projection here, giant RGB floating balls there. This is the part where you get to “be an LD” and forget all those boring things like keylight and houselights. Modern lighting equipment to the rescue! At drama school, our lighting tutor told us that every lantern had to do two jobs. At least. Modern intelligent lighting has given us the ability to turn a keylight into a media projection special and then into a colour wash. This means that a large scale lighting design is no longer about allocating a fixture one specific function. Yes, a big project is broken into smaller chunks, but each of these chunks is now multi-dimensional. Eeek! Modern lighting designers can use the “old” methods to help them make rational decisions about equipment and infrastructure. On a large lighting design, there is just more of everything. How all the technology relates to an artistic vision of the spectacle is the real job of the Lighting Designer. So, maybe not so much has changed after all. If you have any comments or questions about specifying large lighting rigs or technology and lighting design, put them in the comments box below. I was wondering how large of a lighting crew do they have for the lighting on a huge scale production like the olympics. Is there just one guy at a huge table controlling everything. Or are there people responsible for cueing lighting different portions. Also how much of everything is automated and how much is guided and controlled live? The crews on large events run can be up to 50 odd production lampies, depending on nature of the shows and the build time. Skilled techs are also supplemented with semi-skilled crew who help with the graft. Not sure I know anyone working in Beijing (DM is Lighting Designer for the handover to the UK – so I probably do) but if I find out, I will get a figure. I have worked on quite a few gigs of a similar scale and it’s all about good organisation. Control for large shows are often semi-automated. Operators and control systems working in harmony. The biggest challenge with one large rig, is actually programming – too much for one person. It used to be that several operators ran different desks controlling a few DMX universes with particular models of fixture on – then they all ran the show. Now, the use of ethernet means that multiple operators program their desks simultaneously, merging control signals though one gateway that is used to trigger the show. Although the Sydney Olympics was a while ago, Brad Schillers Book on Automated Lighting is still worth a read for his diary fo the event. I am very interested in becoming a Lighting Designer. I have worked with stage lighting before, designing and running lights for high school productions. But, I do know that I need a lot more experience. I was just wondering if you could give me any advice on how to start a career as a Lighting Designer. Melissa, this process is not easy. A formal education in technical theatre lighting and practicum college corses is a good way to start. After you know your theory try to get a technical position in a theatre, ideally apprentice for a resident lighting designer. Learnning rigging and becoming a master electricain will help. Also get your hands on as many lighting productions as possible. In my carrier the majority of experience I gained was from doing various productions: pep rallies, school theatre (like yourself), disco and club lighting, event lighting, exhibit lighting, etc. eventually I got invited to work for Duke University theatre, it was a very challenging job – we worked on average 70 to 80 hours a week. But, again I was able to gain a lot of technical knowledge and also test some of my lighting design ideas. eventually I moved out of NC to Miami and started my own architectural lighting design company. Good luck in your career pursuit!